We’re all accustomed to stocking our pantries with certain basic items but making the switch to pure vegetarianism, even part-time requires an introduction to a few new essentials. Adding these items to your kitchen will ensure that you’re always prepared to make fantastic, healthy meals. Similar to honey, a great natural sweetener. A must-have grain. Make sure to get brown, which is nutritionally better for you than white rice. Great for cheesy sauces, breading, dressings and soups, as well as sprinkled on pasta. This pure veg ingredient will also help you to get essential vitamins like B12. You’ll be using a wide range of them all the time in pure veg dishes. And curry pastes, too. I like to keep apple cider for some baking, regular white, balsamic and rice vinegars on hand. I like these better than pasta, although whole wheat pasta is another option. But udon, soba and rice noodles will work best for the many Asian inspired pure veg dishes you’ll come across. Another must-have, for making cashew cream. Great to always have on hand for using in sauces, soups, etc. 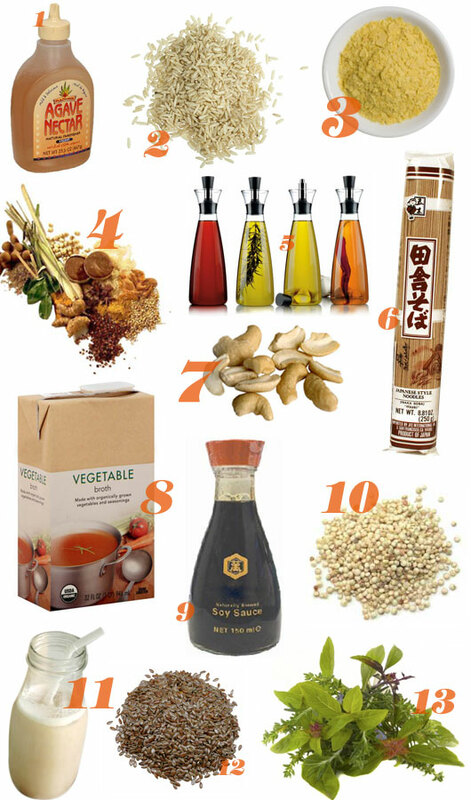 You’d be surprised at how many pure veg dishes soy sauce is necessary for. I always have it on hand. A complete protein. This grain can be used instead of brown rice in dishes. To pour on cereal, for dressings and sauces and for baking. I prefer it to soy milk. Ground for baking. They also go great, whole, on salad. Herbs go hand-in-hand with spices. You’ll always be using a wide range of them to flavor your dishes.